Don't delay, step along to J.H. Wagner & Sons for Sandstone Stepping Stones. Stepping Stones can contribute to the overall effect of any garden. They offer a firm surface for walking leisurely and without concern. If you no longer want to step in mud, walk over and squash your valuable plants or mow the dirt beneath your trees, placing Stepping Stones may be the solution. Mixing and matching the stones until the path is right is often a matter of trial and error, but the ease of placement and shifting allows for change. The farther apart the stones the quicker one tends to walk and the closer together, the slower. Always think of what the walker will see before him or her on the path and strive to create points of interest and places to pause. Stepping Stones can also be laid in water. Make them easy to walk on and anchor them firmly by gluing or set in concrete if necessary. 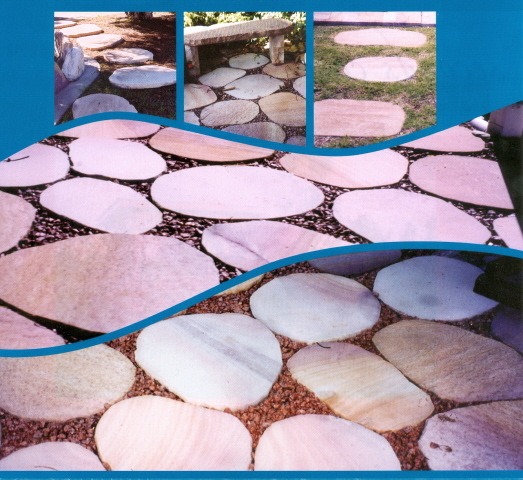 Sandstone Stepping Stones may have a diamond sawn or quarry cut finish on the top and bottom with free-form shapes and split edges. Our Stepping Stones are 40mm to 60mm thick and do not require extensive site preparation for walking traffic. Small, medium and large sizes are available in mixed colour Helidon Sandstone. Discounts apply for full pallet purchases of approximately 80 stepping stones.